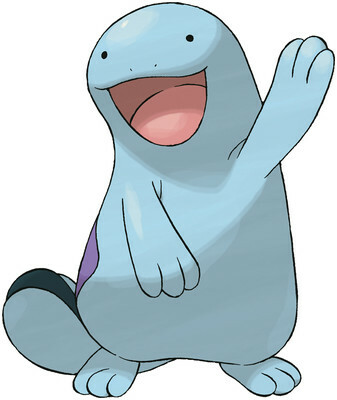 Quagsire is a Water/Ground type Pokémon introduced in Generation 2. It is known as the Water Fish Pokémon . The effectiveness of each type on Quagsire. In Generations 2-4, Quagsire has a base experience yield of 137. This carefree POKéMON has an easygoing nature. While swimming, it always bumps into boat hulls. A QUAGSIRE hunts by leaving its mouth wide open in water and waiting for its prey to blunder in. Because it doesn’t move, it does not get very hungry. It has a sluggish nature. It lies at the river’s bottom, waiting for prey to stray into its mouth. A dim-witted Pokémon. It doesn’t care if it bumps its head into boats or rocks while swimming. It has an easygoing nature. It doesn’t care if it bumps its head on boats and boulders while swimming. Quagsire learns the following moves in Pokémon Ultra Sun & Ultra Moon at the levels specified. Quagsire learns the following moves via breeding in Pokémon Ultra Sun & Ultra Moon. Details and compatible parents can be found on the Quagsire egg moves page. Quagsire can only learn these moves in previous generations. It must be taught the moves in the appropriate game and then transferred to Pokémon Ultra Sun & Ultra Moon. Quagsire learns the following moves in Pokémon Sun & Moon at the levels specified. Quagsire learns the following moves via breeding in Pokémon Sun & Moon. Details and compatible parents can be found on the Quagsire egg moves page. Quagsire can only learn these moves in previous generations. It must be taught the moves in the appropriate game and then transferred to Pokémon Sun & Moon. What is a good moveset for Quagsire? What's up wth Quagsire in OU? Is anyone else having trouble with PokèTransporter?